If you do any inter-continental travelling, you’re sure to have routed through Heathrow (EGLL) at some point. Although London has five airports in and around the city, Heathrow handles more traffic than all the others put together. With more than 72 million passengers last year, it’s also the busiest airport in the world in terms of international passengers. Yet in terms of aircraft movements it’s only tenth, with O’Hare International in Chicago holding the crown, handling a staggering 585,517 aircraft in 2013, as against Heathrow’s 376,800. 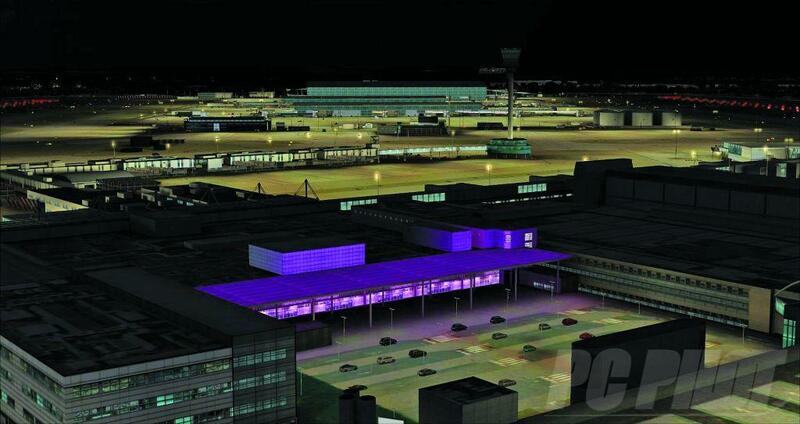 Like the majority of international airports, Heathrow has been modelled before for FSX, the best of these (in my opinion) being Gary Summons Heathrow Extreme V3, released earlier this year and the original Sim-wings version released back in 2007 (was it really that long ago?). Well obviously Sim-wings also thought it was about time it updated its product because here we have Mega Airport London Heathrow Xtended. But we’re not looking at an update here. 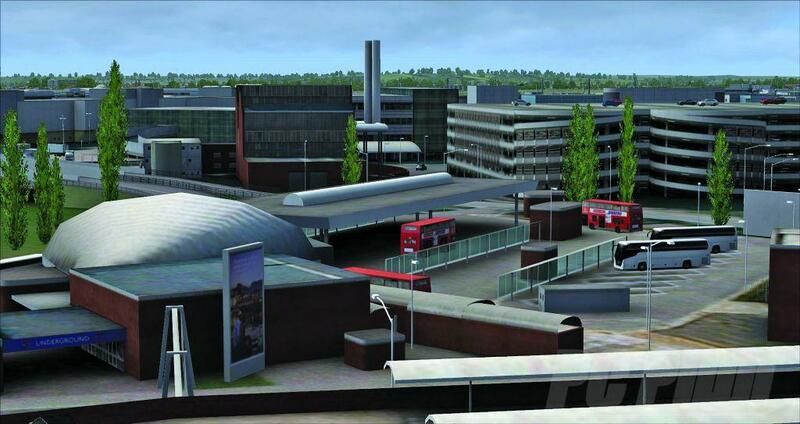 Heathrow has changed so much in the past seven years that Sim-wings has produced a brand new product covering 42 sq km. As usual the product is available as a boxed or download version. The boxed version was not available at the time of writing but should be by the time our magazine goes to press. With a file size for the FSX version of over 4.2GB, it’s the first time I would suggest getting the boxed version. The reason is that the package includes all three versions (FSX, FS2004 and Prepar3D), which together come to a little over 9GB. That’s a fairly hefty download whatever broadband package you might have, although to be fair you don’t necessarily have to download all three; you could just download the one appropriate for the simulator you’re currently using. Each product comes with a setup program, so installation is quite straightforward. You merely have to enter the unique code supplied by Aerosoft when you purchased the product. A fairly important question these days is one of compatibility – whether a product will happily integrate with those we might already have on our systems without causing the annoying crossover of objects or textures that sometimes flash on and off. The main issue of course is going to be with global and photographic scenery products from companies such as Orbx and Just Flight. 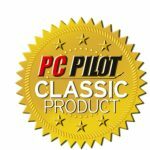 I already have Orbx Global and its FTX England and Wales products installed, so I was interested to see if there would be any issues with these. As it happens Orbx is one of the few companies that provides a scenery switcher; so if there is a conflict, you can at least set your system back to the FSX default texture files. Fortunately, prospective buyers can relax as I didn’t encounter any compatibility issues at all. 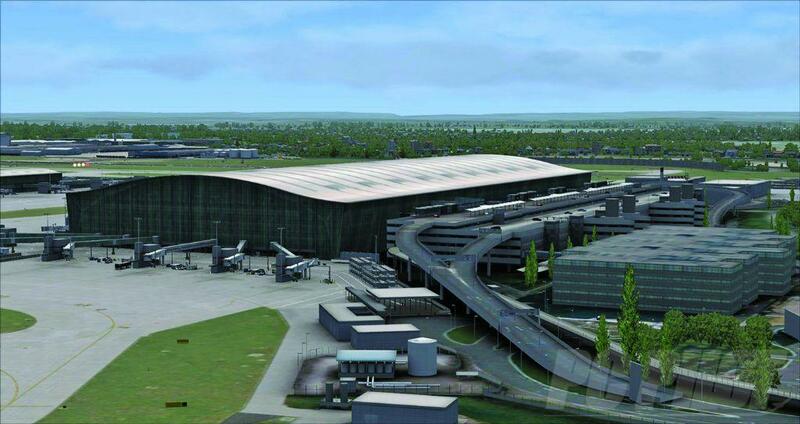 After reading the Sim-Wings Heathrow manual, it seems that the developers are mindful of these potential problems and have designed the scenery to blend with just about any existing scenery you might have. Clearly it’s impractical for me to test this contention as I don’t have access to all the different products that could potentially cause a conflict. But as far as the Orbx products are concerned, I’m happy to say that they meld together quite nicely. I imagine the task of designing an airport like Heathrow must be a daunting prospect when you consider the sheer scale of it and the enormous number of different buildings to contend with, not to mention the ancillary objects and vehicles you’ll see strewn around the aprons of every major airport. All these have to be photographed, drawn, planned and modelled, then the textures have to be created and applied to the 3D structures, bringing the whole thing to life. 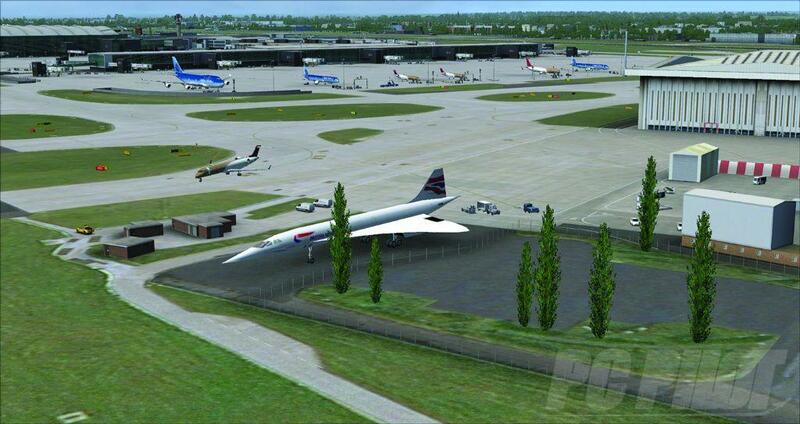 Well, it seems that Sim-Wings is more than equal to the task, because its depiction of Heathrow is commendable. While the modelling is of a high standard, the designers have obviously shown a degree of restraint by not making the 3D structures too detailed. This, in my opinion, is a sensible approach as we’ve all seen a level of detailing that will bring FSX to its knees, which to be honest is pointless. The hardware has to be able to cope with the demands of the software or you could end up with something more resembling a slideshow. This is not the case with Sim-Wings Heathrow by the way. As I mentioned earlier the product covers more than 42 sq km, not just the airport itself. So it is well worth taking a few sightseeing trips, particularly if you’ve been to Heathrow before, if only to see how this version compares with your own experiences. For example, as you approach the airport through the main entrance, there used to be a 40% scale model of a BA Concorde. It’s now been replaced with a similar scaled model of an Emirates Airbus A380. However, I’m pleased to see that BA has still retained one of these iconic aircraft, which is now sited outside its engineering building at Heathrow. 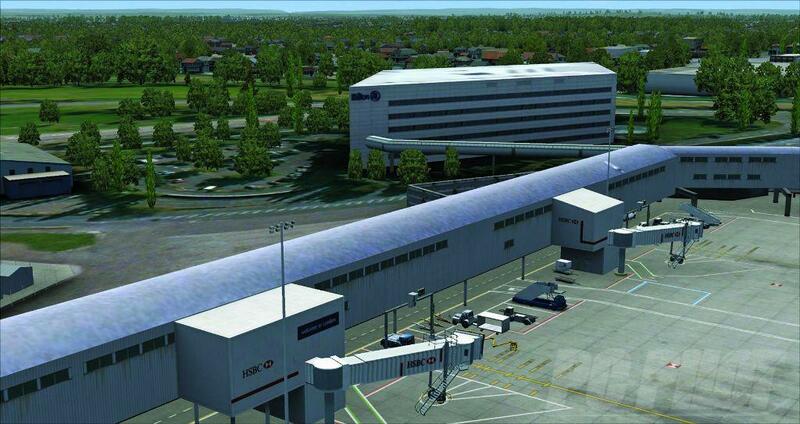 You can see both of these in the Sim-Wings version: Concorde is on the right, as you make your approach to runway 27L, while the A380 is mounted in front of the underpass leading into the airport itself. Bath Road runs along the northern perimeter of the airport, parallel to the two runways. 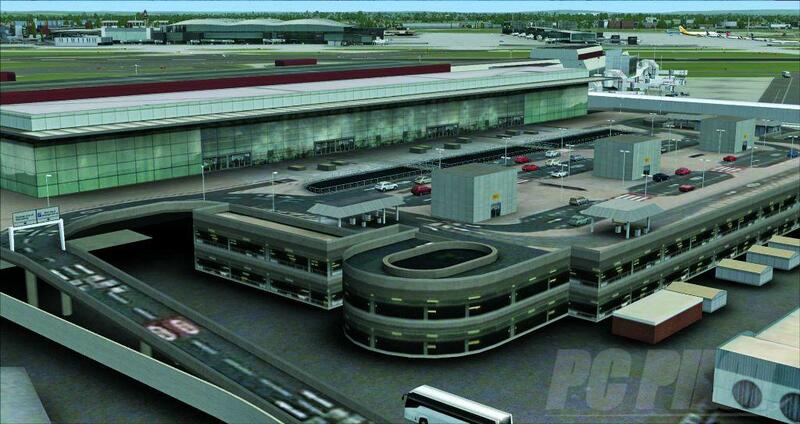 It’s where most of the hotels and businesses that service the airport are situated. So if you fly along this route you’ll see the more prominent ones depicted, for example there’s the Holiday Inn, Renaissance Hotel, a couple of car rental agencies and more. There’s also a Hilton Hotel just behind Terminal 4. 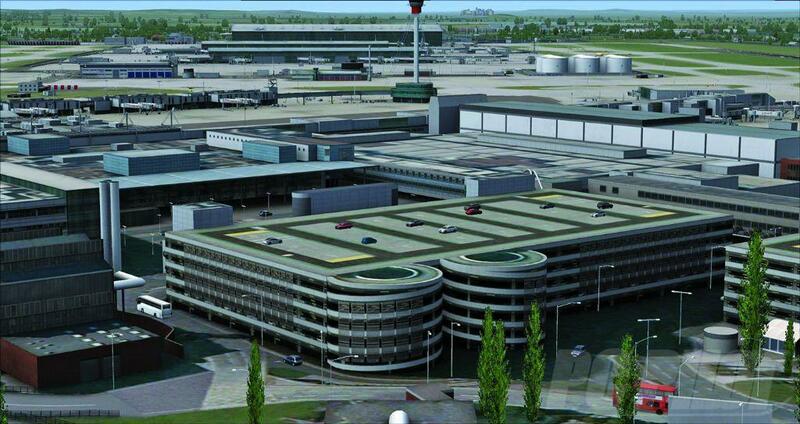 Heathrow has five passenger terminals, the latest and largest of which is Terminal 5, situated at the westerly end of the airport, midway between the two runways. 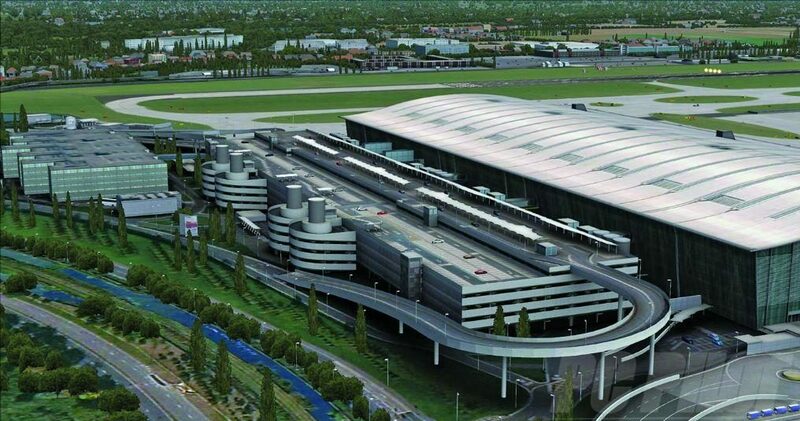 It was opened in 2008 and was initially used solely by British Airways as its global hub. 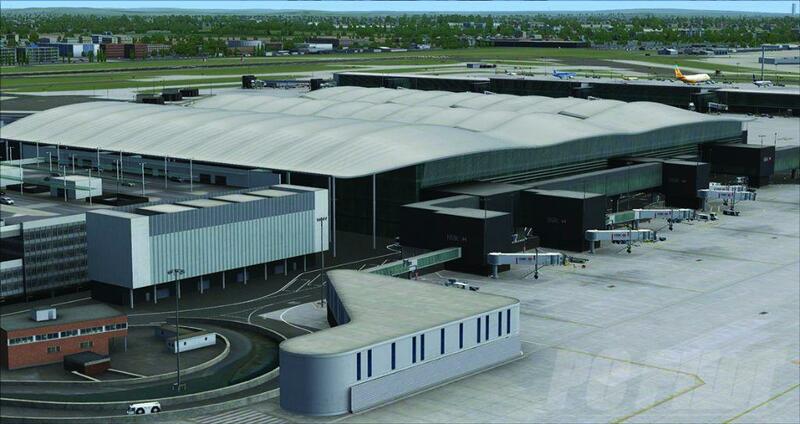 It has two satellite buildings, one of these (Concourse C) has larger stands dedicated to the Airbus A380. 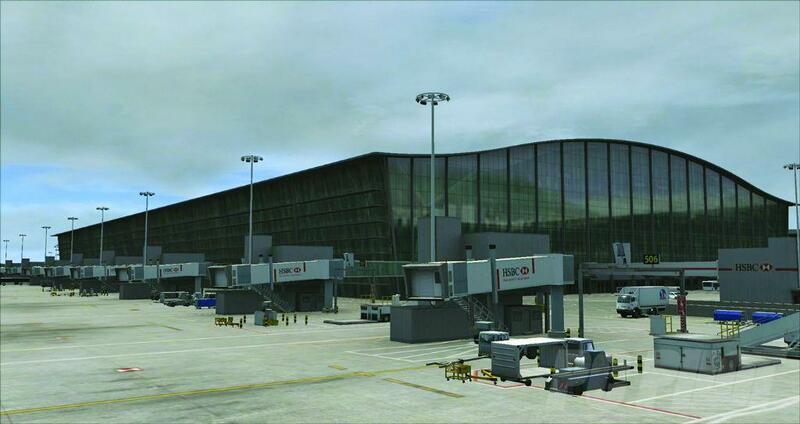 These, like all the stands in this Sim-wings version of Heathrow, have fully operational Safegate docking systems. Terminal 5 is an imposing four-storey structure with its own elevated roadways and multi-storey car park at the front and four spiral road ramps leading to each floor. The Sim-Wings designers have recreated it beautifully, yet with a skilful use of textures depicting more detail than is actually modelled. As I mentioned earlier this is not really a criticism, because I’d rather have an airport that is a fair representation of the original, but doesn’t stop me flying the more complex aircraft I’ve invested in. The M25 motorway runs past the back of Terminal 5, and again this and the complex roadway systems running into the airport are accurately modelled. Unlike Terminal 5, each of the other terminals seems to have evolved rather than been designed. I guess the increasing demand for more flights has determined how and when they were built or extended. However, this maze of complex walkways, roads and tunnels has been recreated in almost ridiculous detail by the Sim-Wing designers giving you a real impression of the complexity and vastness of this site. 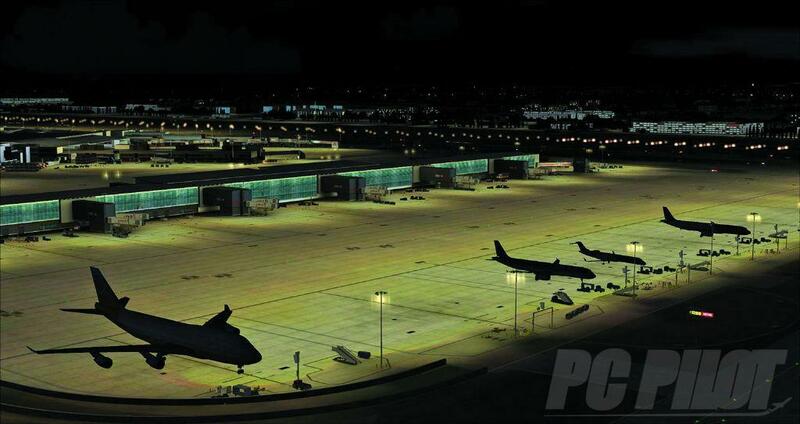 This is just as evident at night, because in some FSX airports the approach and apron lighting can look unrealistic, generally due to the colour palette used by the designers. 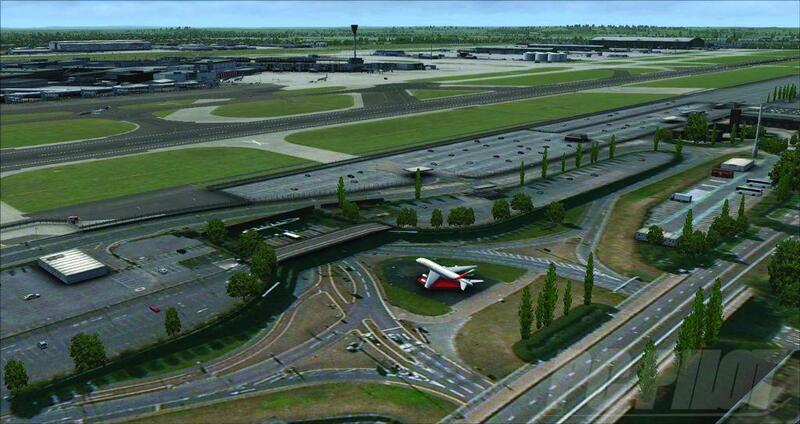 Yet in this version of Heathrow, Sim-Wings have nailed it. Approaching the airport at night is just brilliant as the runway lights have the correct intensity, so they look correct from the cockpit. Then, as you taxi in you’ll notice that the huge floodlight masts have proper illuminated bulbs set just below the top, as they are in reality. There’s also a realistic variety of lighting within and spilling on to the buildings, some are even floodlit in different colours. Obviously, how a product might affect your system’s performance will be high on most users’ list of questions to ask. No matter how pretty it might be, or how well it depicts the real airport, firstly it has to be useable and to be fair Heathrow certainly is. It’s true that unless you’re running a very high spec machine you’re going to lose some performance, yet even after a few long trips into Heathrow I didn’t experience any accumulative degradation. I didn’t get any ‘out of memory’ errors either, but equally I didn’t run FSX with the scenery settings maxed out. The advice that Aerosoft provides in the manual covers these issues at length, so it’s worth reading and taking the time to adjust your settings in order to reach that performance sweet spot. It’s a shame that developers always have to consider these performance issues when designing airports and scenery because given free rein I’m sure we would see even more spectacular scenery. Once again I reiterate that’s not any criticism of Heathrow as it’s an accurate depiction of the airport and the immediate area surrounding it. In fact the wider footprint used by the developers, means that approaching the airport from any direction is very realistic indeed, consequently I have no hesitation in recommending it to all our readers. 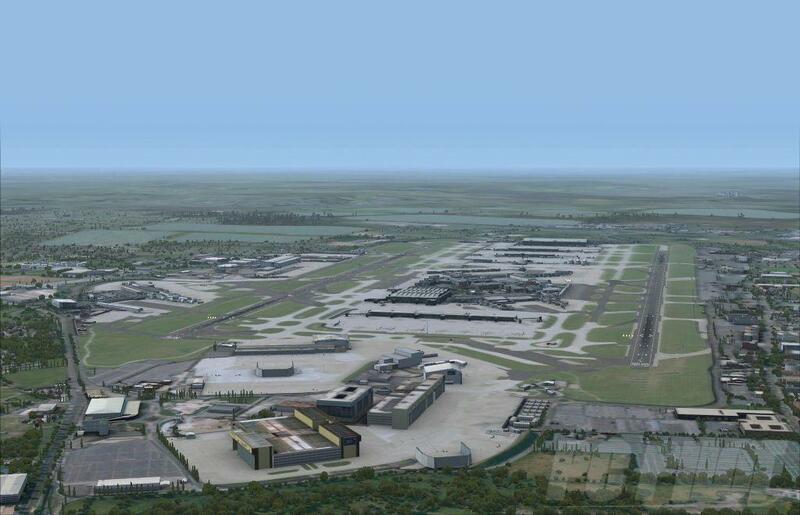 At a glance: A mega version of Heathrow airport from Sim-Wings, designed with performance in mind, yet still with a high level of detail and accuracy. 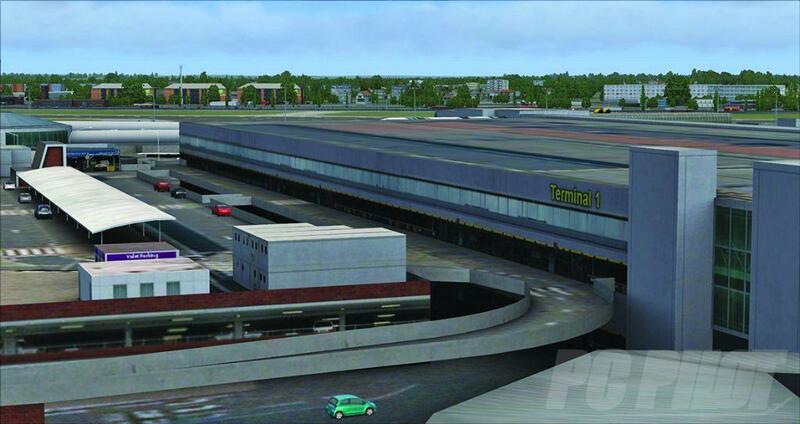 System requirements for FSX / Prepar3D: Microsoft Flight Simulator X (incl. Service Pack 2 or Acceleration Pack) or Lockheed Martin Prepar3D V2; Windows XP (SP2) / Vista / 7 / 8; Dual Core Processor with 2.66GHz or faster; Minimum 4GB RAM; 3D graphics card with at least 512MB; Download-Size: 4.5GB; Installation size: 4.7GB. Recommended: 3.4GHz processor (Quad Core processor or higher system); 8GB RAM; 3D Graphics Card with minimum of 2GB RAM; SSD or a fast hard drive. 1 Terabyte Seagate Barracuda Hard Drive.